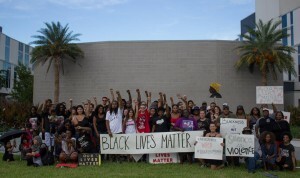 Now that it’s in the rearview mirror, it’s worth reflecting on just how crazy, and game-changing, July 2016 was for the Black Lives Matter movement in Broward and the rest of South Florida. For most of the summer, it seemed like nationwide attention on the movement would continue to take a back-burner to the Presidential election circus. All that changed with the killings of Alton Sterling (7.5) and Philando Castile (7.6). 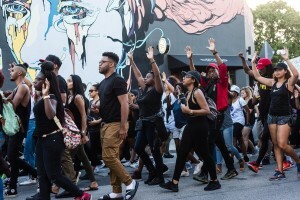 Almost as soon as the video of Philando began circulating on Facebook, it quickly became apparent that Black Lives Matter would not be waiting until after November to make a come-back. Micah Johnson’s sniper attack in Dallas would not dissuade us either. 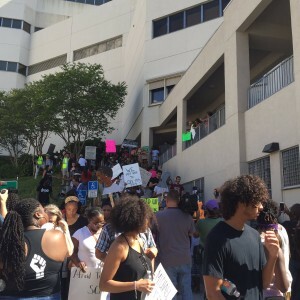 On July 9th, the Black Lives Matter Alliance Broward led a huge march to Broward County Jail, with attendance around 500. 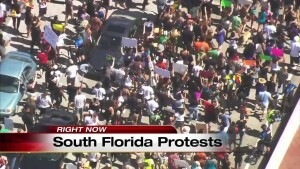 It was potentially the largest street demonstration in downtown Fort Lauderdale since the Occupy movement of almost 5 years ago. 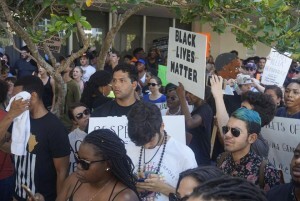 Coining the hashtag #blm954 along the way, the Alliance surged into the public discourse of South Florida politics. 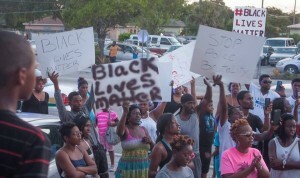 Unbeknownst to most of us, another protest sprung up on Sistrunk the same day with dozens more in attendance. 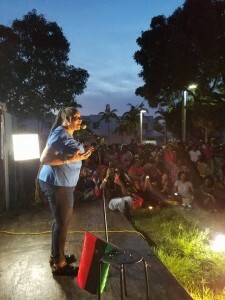 The next day, the Alliance again brought out hundreds to the Megaphone for a Community Circle on police violence and black healing. The weekend of 7.9 was an incredible catharsis for a County that has waited far too long for such a time. 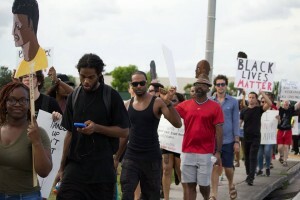 Miami would soon follow with their own Community Circle and a demonstration in Wynwood on 7.11, and Miami Gardens marched as well on 7.16. 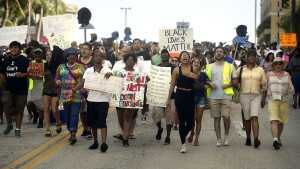 There would be little time for the South Florida movement to pause. 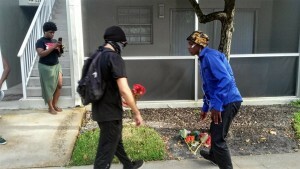 On 7.18, North Miami Police officers responded to 911 calls and wound up shooting therapist Charles Kinsey. Although he survived, the video of Kinsey, on the ground, with his hands in the air, begging not to be shot, once again burned through the consciousness of America. 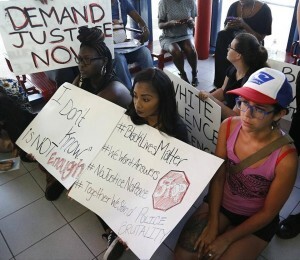 Protests and a sit-in at North Miami Police Department took place on 7.21 & 7.25…so far the police’s handling of the situation has not inspired much confidence. 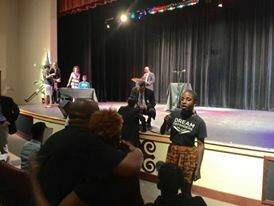 Meanwhile in Broward, the Alliance had been trying to pull together its own candidate debate for Broward County Sheriff for some time. 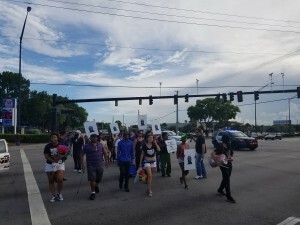 Bowing to the pressure from BLM’s public resurgence, Sheriff Scott Israel changed his mind at the last minute and joined in alongside his many challengers on 7.20. 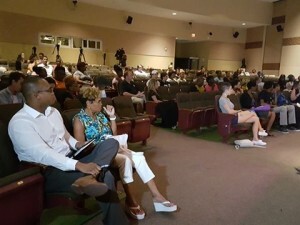 Hundreds attended in person and online for the livestreamed debate, which proved to be one of the most hard-hitting and relevant community events for Broward’s local election season. “The People’s Debate” was yet another high point for the movement’s rising political power. The intensity reached an unbearable climax at the end of the month. The Alliance always holds a monthly meeting on the last Wednesday of the month, and we had already moved venues to the African American Research Library, expecting a record turn-out. 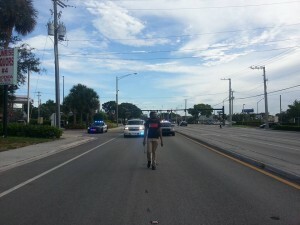 At the same time, a crucial decision was pending in the manslaughter case against BSO Deputy Peter Peraza. 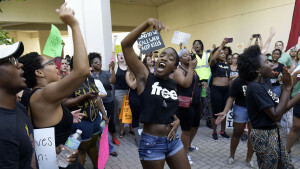 In the kind of nightmare crap-storm that no one can really prepare for, Peter Peraza’s charges for the shooting death of Jermaine McBean was dismissed under Florida’s Stand Your Ground laws Wednesday morning, 7.27. 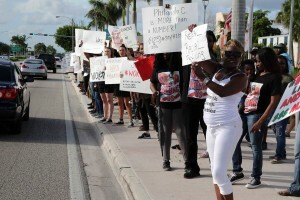 The McBean family, about 200 people, and the majority of South Florida’s news stations came to the AARL that night. Jermaine’s brother, Andrew, took the stage and spoke truth to power. Coming to this point as a community was a relevation. Nothing like this had happened here before. 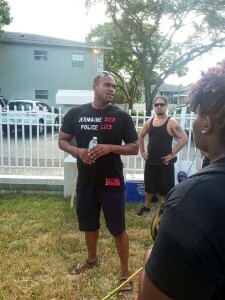 Also on 7.30, One United Bank held a #bankblack event at their Miami branch. 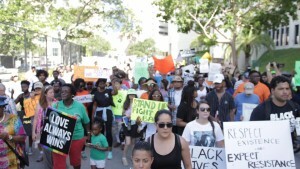 Over 1000 people showed up to open an account at the black-owned bank as a protest against the status quo. Finally, on Sunday, 7.31, the Alliance joined Andrew McBean one more time to retrace the last steps of his brother. 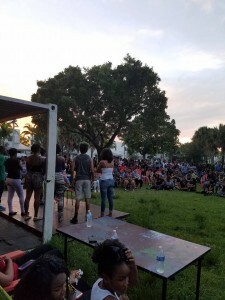 It was just a couple of blocks along Dixie Highway in Oakland Park, but the emotion and energy in that space was undeniable. 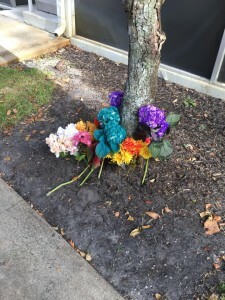 We laid flowers at the site of the shooting, exactly 3 years ago that day. 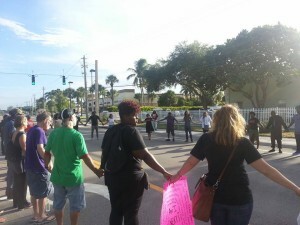 Finally, we gathered in a huge circle stretched across Dixie Highway and talked about what we were there to fight for. July’s gonna stick with us for a long, long time.